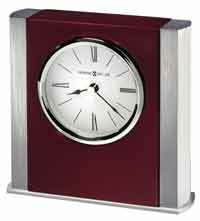 Howard Miller Ambrose 645-797 Desk Clock has a elegant rosewood high-gloss finish. Brushed brass-tone base plate with polished sides and curved brushed and polished brass-tone metal sides. 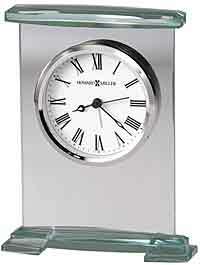 Stylized Roman numerals at the 12, 3, 6 and 9 positions stand out on the white dial. Black bar markers and a glass crystal, surrounded by a polished brass-tone bezel finish off the look. 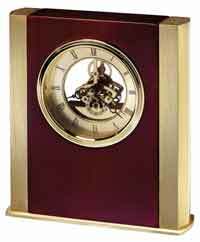 Black hour and minute hands, and a brass seconds hands complement the face. Felt bottom helps protect your table or desktop. Accurate Quartz, battery-operated movement includes one AA sized battery. 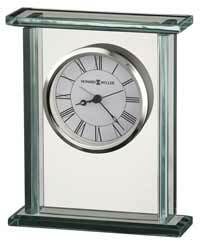 Size: Height 6", Width 6", Depth 1.75"
Clocks for sale at The Clock Depot including the 645-797 at discount prices.